BATMAN DAMNED 1: bloody good mystery launches DC Black Label in a vivid horror-noir style spawned from writer Brian Azzarello and artist Lee Bermejo. Who killed the ghastly corpse that is retrieved and found to be the Joker? Who mortally wounded Batman? And why can’t he remember what happened? BATMAN DAMNED 1: there is a buzz with this book! The art by Bermejo is masterful in the bleak view of Gotham and the Dark Knight and the hyper-action sequences that flow and dance off the page, like a great swordfight. The world, from gambling on dark street corners to bashing medical staff for an escape route, is very much alive. And just look at Bermejo’s BATMAN DAMNED 1 cover! I thought Jim Lee and Alex Sinclair’s pentagram-backed caped crusader, and a lot of emphasis on a particularly badass-looking cape, was stunning (and it is). But then I saw the steam coming off of the battered cowl in Bermejo’s Batman, and I realized the lunatic-like bloody expression beneath that cowl was worn and scraped, and either grimacing or . . . smiling! Was Batman smiling like the Joker? 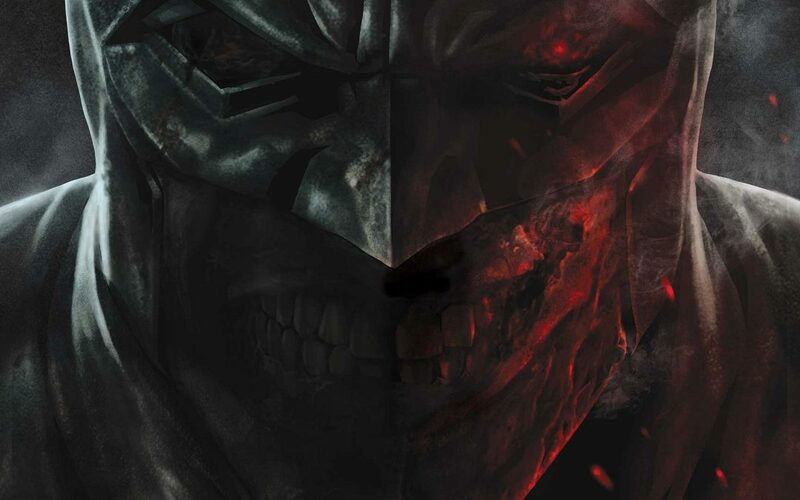 The depiction of a militarized Batman by Bermejo is iconic. The Rambo-like Bat Belt and its dangling straps with rings for hooking weapons and tech to the beaten leather-like material and the many buckles on the worn army boots give a fierce edge to the amnesiac Batman. And the talented scribe Azzarello crafts an ingenious and twisted tale of mystery, horror, and Bat-lore that shoots from page to page, impact to impact, whether it is physical blows, or mental, or emotional ones. His Batman has to deal with a supernatural influence, a hole in his memory, and the detective case of a lifetime. But there are also the wrinkles and the deeply hidden crevices in the world where metaphors for Satanism and Christianity, for the Gothic towering over Gotham and the strange creatures crouching in Bruce Wayne’s past and present shadows. The DC Black Label launch title BATMAN DAMNED 1 is incredibly enticing for the adult comic book reader with a dark side. The oversized format is incredible to behold in and of itself. BATMAN DAMNED 1 is ad free and chock full of gorgeously detailed and gritty oversized pages. 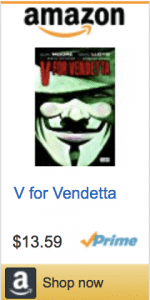 This book should not be approached by the faint of heart or the Puritanical among us. Get yours from your LCS – Red Shirt Comics got me – before they are gone forever! Frankenstein Alive, Alive! Trio was written by Steve Niles and illustrated by Bernie Wrightson sans the “Trio” part in the 1980’s, and is a part of IDW Publishing’s new mini-series collection featuring three of the gorgeously reprinted monster -horror comic books, and a fourth issue is coming. This POWkabam review of Frankenstein Alive, Alive! Trio examines a book that blew the doors off my feeble mind. My LCS [local comic shop] owner pointed this out to me a couple weeks back, at Red Shirt Comics, and I became enamored with the ingenuity of the Mary Wollstonecraft Shelley Frankenstein sequel for both the innovative storytelling that Ms. Shelley would be honored by and the incredulous black and white spreads of artwork unlike anything I have ever seen. Frankenstein Alive, Alive! Trio is a stunner of a monster tale and, much like Frankenstein, so much more! And Frankenstein’s Monster, the deeply disturbed, organically rotting, humanistic, and intriguing protagonist of this yarn draws in readers from the very first and refuses to let them go without sympathizing for such a creature whose thirst for intelligence, whose guilt, and whose loneliness reveal so much more of the raw character that Ms. Shelley introduced us to (and scared the bejesus out of us with) over a hundred years ago. Niles has brilliantly evolved Frankenstein’s Monster. And I think he does this in a way that is a natural progression from where Ms. Shelley left the Monster. 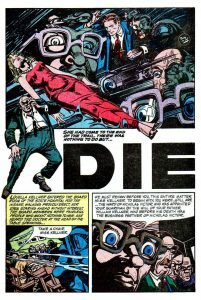 As Dr. Frankenstein echoes the Monster’s inner guilt by declaring him a murderer, likely without a soul, the Monster attempts to commit suicide. We do not know what a supernatural being brought to life from the warped experiments can survive or how long he could live for instance, and the Monster does survive being frozen and encased in compounded rock and/or ice. The Monster’s inner turmoil while living amongst humans makes for a look into its inner-most hell. The Monster’s journey eventually takes him to a sideshow at a carnival where he terrifies people for a living. But there he does not feel so out of place. Before he gets there, he achieves his first ever friend only to witness that mad scientist’s plot: to murder a young woman’s soon to be born child in order to fuel a concoction to resurrect the doctor’s comatose wife. His first impulse is to kill his friend before he can commit such a heinous murder. But then he exits and reflects on how this man took him in and became his friend. What does the Monster owe mankind to act on its behalf? It is a conundrum left for the next issue. 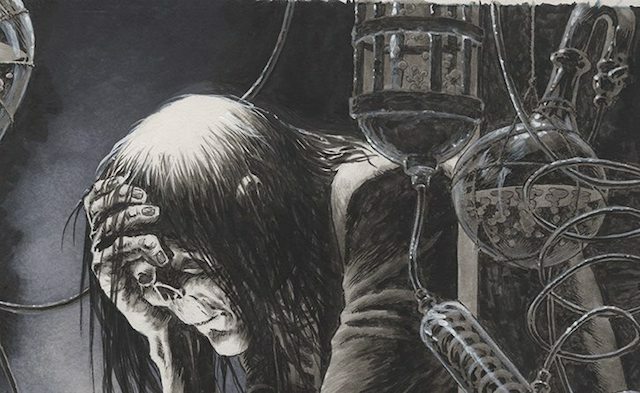 The artwork of Mr. Wrightson, who famously wrought the skull-like, nose-less, visage in his version of Frankenstein’s Monster is truly as remarkable as it is chilling. The incredibly detailed black and whites of the shadowy castle bricks and the snow and all the morose scenery, the lively characters depicted with each one having a personality all their own, and the bubbles in the many glass beakers make for a transformative experience. The art adds to Niles’ story and makes the mystery deeper and the sense of urgency and panic and horror all come through. How will it turn out in issue Frankenstein Alive, Alive #4 is what I want to know. “Review Frankenstein Alive, Alive! Trio Monster’s Inner Hell” was written by R.J. Huneke.